Pete is having problems with his computer so I'm doing this one for him. 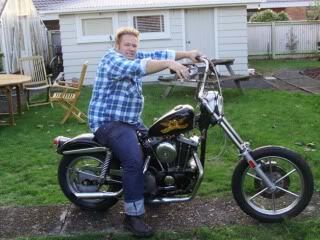 Pete has always been into bikes and cars and music. He's got a 2003 Heritage that he's going to keep forever but I csan't talk him into cutting it up so he's eventually broke down and got this Ironhead. 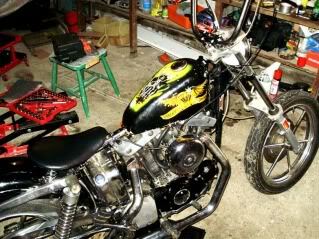 Its a 73 I think (Pete can confirm) and its the same year as Pete's first Harley. Same reason I got my 84. Ugly as sin when he got it but Pete is slowly sorting it out. The Invaders are cool but they will get replaced eventually with 18 and 19 inch spoked wheels. Pete and Christina are expecting their first baby this week so they have other things to worry abut beside bikes. 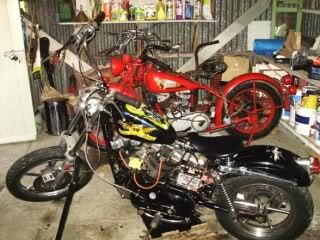 He did try and talk Christina into letting him buy that 4 grand Ironhead off trademe this week. We have all talked him into keeping the old school tank art for a while at least. His shed is sharing space with a few others. Pete's Indian Scout lived in my garage for a year and is still leaking. 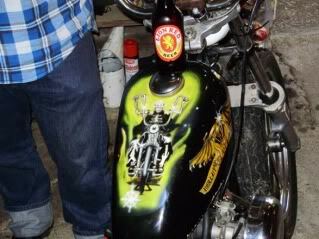 This is Luke's Norton. 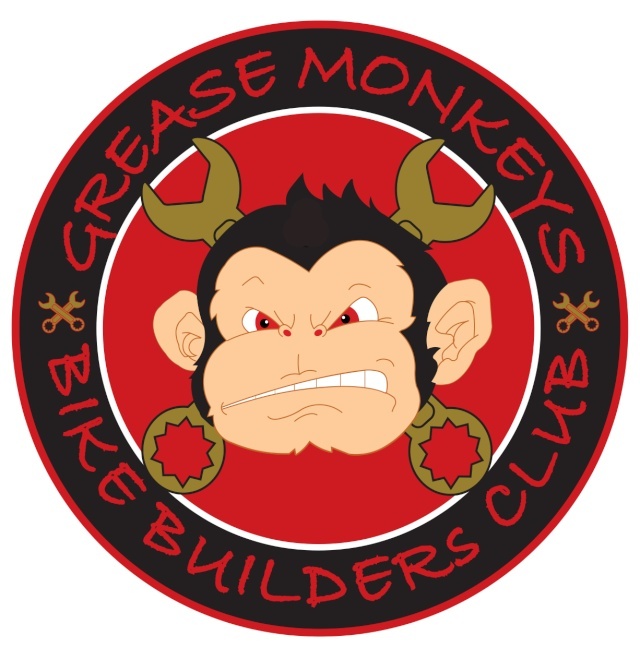 Look is helping redesign the Greas Monkey web site as soon as he gets some free time from work. He plays guitar in a cool surf band. 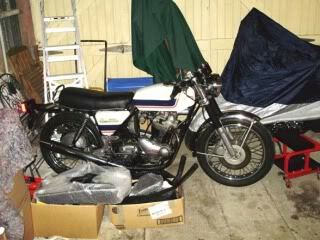 And this one is Deb's Sporty, fresh from England. Over 2000 hand glued crystals on this thing. Not to my taste but she loves it and that's all that counts. 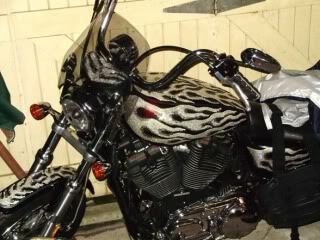 Pete's next door neighbour is another long time biker called Pete. They both call each other Pete the Neighbour. This Pete's current ride is this old Bonnie. 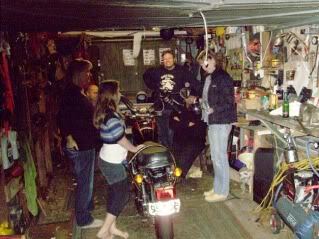 There's always somthing cool about hanging out in other people's sheds drinking beer and talking crap. Pete's next door neighbour is another long time biker called Pete. They both call each other Pete the Neighbour. THis Pete's current ride is this old Bonnie. There's always somthing cool about haning out in other people's sheds drinking beer and talking crap. A men to that. Welcome aboard Pete good to have you here, You'll have to get Pete the neighbour signed up too. Look forward to catching up with you two this Summer. Jeez I am crap at this computer stuff. Just found this bit. Is it a thread? As for getting Pete The Neighbour signed up, he's so old school he has to get his Mrs to clear his mobile phone messages. Although he has sussed out how to search trade me for bikes. Maybe Jon can teach him inter-webby.